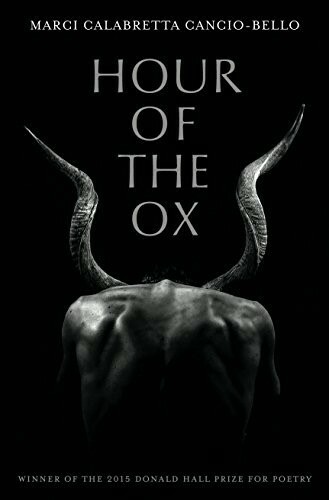 The Hour of the Ox, winner of the 2015 Donald Hall Prize for Poetry, is a deliciously briny collection, so much so that if you were to whisper the poems to yourself, the words would leave a thin layer of salt on your lips. It’s the second collection by award-winning poet, and Miami transplant, Marci Calabretta Cancio-Bello, and tells the story of home before home, the Korea where Cancio-Bello was born before being adopted. The title, The Hour of the Ox, refers to the middle of the night, between the hours of 1 a.m. and 3 a.m., when we’re most likely to rehash regret. In “All the Sheep Have Scattered,” Cancio-Bello calls it “Chewing the darkness,” (12). The collection opens with a poem called “Anti-Elegy,” which indicates both our drive to live while keeping the dead close to us. She writes, “For my brother, who did not die/ no matter how many times we killed him” (1). The poems are set in Jeju Island, South Korea, a matriarchal culture, the poet explains, where women are the primary breadwinners. They dive for pearls and abalone, well into their 60s and 70s and can hold their breath for up to three minutes. Recently, however, young women have been moving to the mainland for careers and education and pearl diving is becoming a dying art (59). In “The Pearl Divers’ Daughters” Cancio-Bello writes “Our mothers carved veins into the sea” (36). She seems to mourn the culture’s loss when, in “Old Country, New World,” she writes, “Although I did not know it, Mama sewed/ pearls into my skin: each vertebrae, each/ tooth and eyelash stitched in salt-laced dew/ and the ash of incanted incense, strung with the thread of old blood” (5). Cancio-Bello experiments with sijo, a Korean poetic form similar to the Japanese haiku. She explains, “the three lines average 14 to 16 syllables. They may be narrative or thematic. The final line often employs a twist. Sijo are seldom humorous or witty” (59). The form explores themes that are bucolic, metaphysical and cosmological. In “Sijo for Early Spring, Year of the Boar,” she writes, “My parents are rearing a new dog, a mottled, long-legged mutt/ These days, even neighbors skirt the yard when they sweep the porch/ the wind dispersing ash from all the bowls of incense at the shrine” (53). The images of ash and incense repeat. The word tide is a metaphor for movement and time. Sea animals parallel our own lives. She speaks of prying a pearl from an oyster as if it is childbirth. We are strangled by octopi. Sea urchins are, in “The Sea Urchin” a “bit of ocean into my cupped hands” (33).” Water deer, the poet explains, “are native to South Korea, are larger than the Florida Key Deer but smaller than a white-tailed deer and no antlers” (57). They are first introduced in “Anti-Elegy” as “offering their own children to our grief” (1). The theme of grief is woven into the collection. In “Disconsolate Brother Returns as Penumbra” she writes about the physical connection we feel to people we’ve lost, “but tonight, thin and knob-kneed/ as a heron, you come to lean/ against the wall, your shadow/ sown to my feet” (7). In “Apperception,” Cancio-Bello writes “We can’t calculate grief, she says, any easier than we can calculate the infinite numbers between zero and one.” and “there is no number for this grief/ for the handfuls of breaths/ you want to press back into his lungs” (51). Yet, these poems take us on a journey as cyclical as the tide. We do not only examine grief. We also examine creation. “Generosity” is a re-imaging of the Korean creation myth, wherein a bear stayed in a cave, eating mugwort and garlic for 100 days and, as a reward, was transferred into a beautiful woman. The king of heaven then married the woman and their son became the first human king of Korea. She writes, “…[O]ur mothers were hidden bears/ scrawling petitions on the white skin of birch bark/ answered once through sacrificial language/ pitied, torn open, given sons, all gifts” (24). Kelly Wolfe is an Assistant Professor of English at Johnson & Wales University in North Miami, where she teaches writing, literature and communication. Before that, she worked as a journalist for 10 years at The Philadelphia Inquirer and Palm Beach Post. She won first runner up in the Norton Girault Literary Prize for Nonfiction in 2014. That essay, “Early Mourning Flight”, was subsequently published in Barely South Review. Her micro fiction, "Beautiful Bicuspid", was published in Gargoyle magazine in 2018.